In case you haven&apos;t heard, Hogan Farms -- located at 8900 E. County Road 1000 North, Brownsburg -- is an incredible fall destination that you&apos;ll want to visit this season. Offering homegrown pumpkins, hayrides, a corn maze, good eats, a petting zoo and a kid zone. Pumpkins -- Hogan Farms offers some of the finest pumpkins around. Choose from those that have been picked and ready for the taking, or enjoy the added fun of picking your own from the patch. You&apos;re sure to find the perfect pumpkin. They have every size, and the pumpkins are priced by size. Corn Maze -- It wouldn&apos;t truly be fall in Indiana without a corn maze, right? Well, this year Hogan Farms decided to go with a patriotic theme. Find your way through an eagle, the Liberty Bell and an American flag by picking up a map and trivia to help guide you. The maze opens next weekend on Sept. 29 and remains open Tuesday-Sunday through Oct. 28. It costs $8 per person to enter. Hay Rides -- Once again, this is fall fun at its finest. Enjoy this classic autumn activity Fridays through Sundays beginning next weekend. The first ride leaves at 11 a.m., the last call is at 5:15 p.m. and the cost is $5 per person. 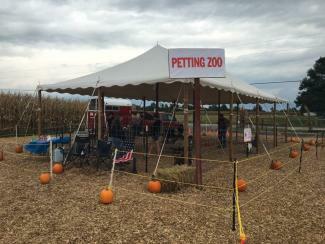 Petting Zoo -- Who doesn&apos;t love a good petting zoo? Ponies, ewes and bunnies - oh my! The petting zoo opens every Saturday and Sunday during the season and is $6 per person, which also includes a pass for the Kid Zone. You&apos;ll also enjoy learning about farm animals from the experts on site. Kid Zone -- This area includes games, inflatables, giant straw structures and bounce houses. Need I say more? You&apos;re sure to wear the kids out here. You&apos;ll want to keep up with all the happenings and news on Hogan Farms website or their Facebook page. 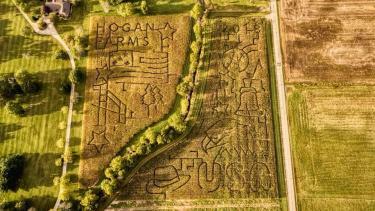 So, head on out to Hogan Farms in Brownsburg to truly experience fall fun in Indiana at an affordable cost. This is the prime opportunity to gather your family, hunt for that perfect pumpkin, take some silly selfies on a hay ride, find your way through a corn maze and get up close and personal with some farm animals at the petting zoo. How cool is that?